Customizing checkout fields using actions and filters should be a task you are comfortable with. If you are unfamiliar with code and resolving potential conflicts, we have an extension that can help: WooCommerce Checkout Field Editor. Installing and activating this extension overrides any code below that you try to implement; and you cannot have custom checkout field code in your functions.php file when the extension is activated. Custom code should be copied into your child theme’s functions.php file. Note: This is a Developer level doc. We are unable to provide support for customizations under our Support Policy. If you are unfamiliar with code/templates and resolving potential conflicts, select a WooExpert or Developer for assistance. The billing and shipping fields for checkout pull from the countries class (class-wc-countries.php) and the get_address_fields function. 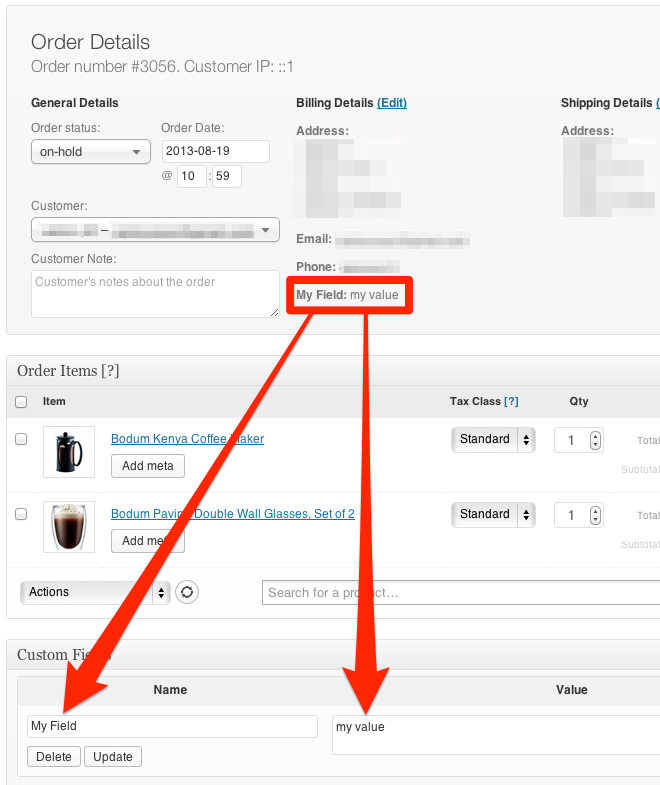 This allows WooCommerce to enable/disable fields based on the user’s location. 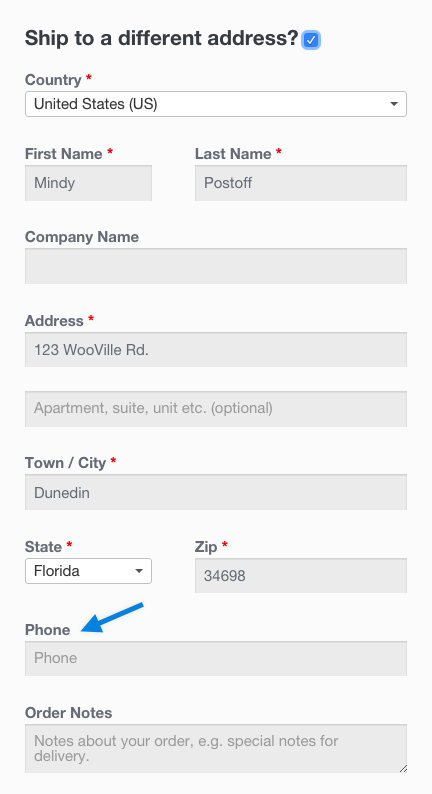 Before returning these fields, WooCommerce puts the fields through a filter. This allows them to be edited by third-party plugins, themes and your own custom code. The checkout class adds the loaded fields to its ‘checkout_fields’ array, as well as adding a few other fields like “order notes”. That means you have full control over checkout fields – you only need to know how to access them. Priority in regards to PHP code helps establish when a bit of code — called a function — runs in relation to a page load. It is set inside of each function and is useful when overriding existing code for custom display. Code with a higher number set as the priority will run after code with a lower number, meaning code with a priority of 20 will run after code with 10 priority. The priority argument is set during the add_action function, after you establish which hook you’re connecting to and what the name of your custom function will be. In the example below, blue text is the name of the hook we’re modifying, green text is the name of our custom function, and red is the priority we set. In this example, the code is set to redirect the “Return to Shop” button found in the cart to a category that lists products for sale at http://example.url/category/specials/. There, we can see the priority is set to 10. This is the typical default for WooCommerce functions and scripts, so that may not be sufficient to override that button’s functionality. Instead we can change the priority to any number greater than 10. While 11 would work, best practice dictates we use increments of ten, so 20, 30, and so on. With priority, we can have two functions that are acting on the same hook. Normally this would cause a variety of problems, but since we’ve established one has a higher priority than the other, our site will only load the appropriate function, and we will be taken to the Specials page as intended with the code below. What do we do with the new field? Nothing. Because we defined the field in the checkout_fields array, the field is automatically processed and saved to the order post meta (in this case, _shipping_phone). If you want to add validation rules, see the checkout class where there are additional hooks you can use. The field is now saved to the order. 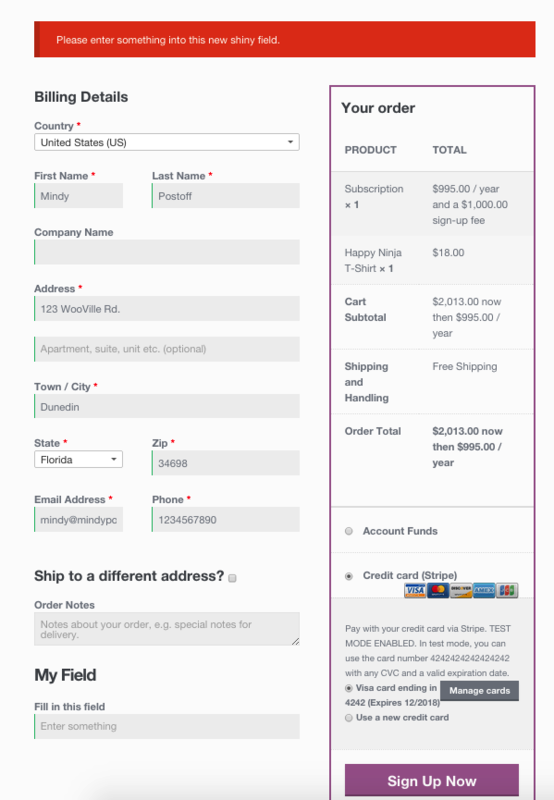 How are checkout fields loaded to WooCommerce?